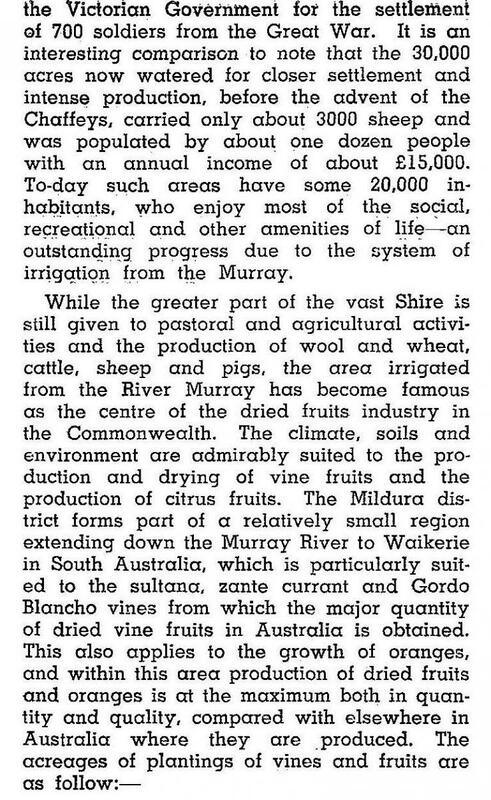 Mildura Shire (1890-1995) was created on 10 January 1890, three years after the Chaffey brothers began the Mildura irrigation colony near the Murray River in the Mallee region of north-west Victoria. It was formed by severance from Swan Hill shire and occupied 11,836 sq km. Walpeup shire was severed from it in 1911, and urban Mildura was made a separate borough – and subsequently a town and a city – on 18 May 1920. Mildura shire included Merbein, Red Cliffs, Irymple and Nichols Point around the Mildura irrigation area. Its western boundary was the South Australian border. From the 1970s onward, outlying urban areas of Mildura were also in the Shire, and several of Mildura’s long grid streets extended beyond the urban fringes into the shire. They were flanked by vineyards and orchards. The shire was accessed by the Calder Highway and railway line from Ouyen and Melbourne. Westwards the Sturt Highway and the Red Cliffs-Meringur Road pass through mainly dry-land farming areas before entering the Murray Sunset National Park, which extends across the South Australian border. There was a railway line through Meringur to the edge of the National Park, opened in stages 1924-31 and closed in stages 1964-70s. The main traffic was wheat, and silos were provided at Werrimull. 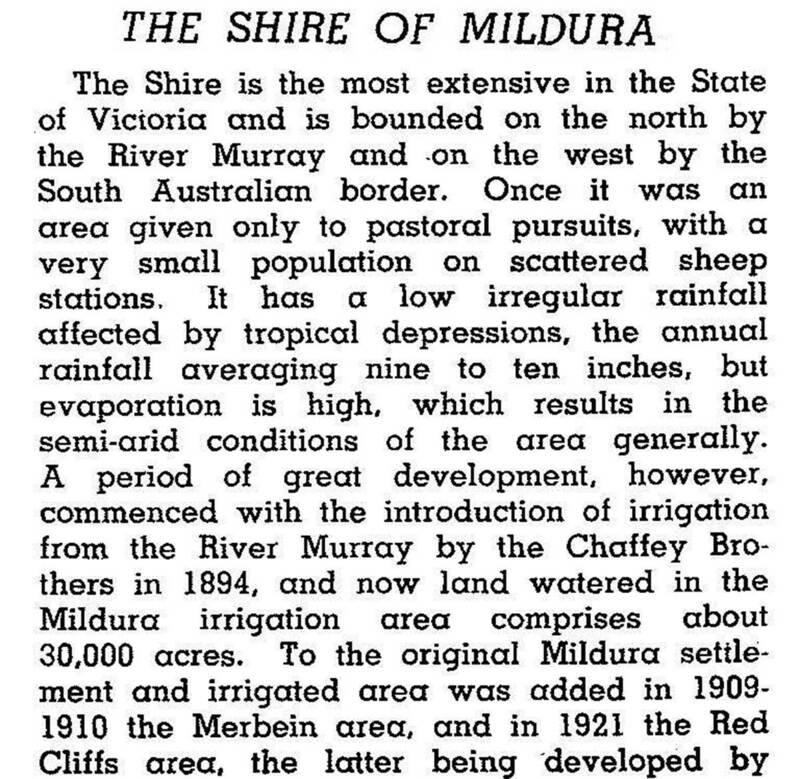 The district through which the railway line ran was known as Millewa, and it was supplied with channels in 1924, carrying water pumped from the Murray. The channels were abandoned as an unprofitable enterprise in the 1940s and holdings were amalgamated. Up to 97% of the water was being lost by evaporation and seepage. In 1975 a piped supply was built. Merbein, west of Mildura, has mainly irrigated vineyards supplying dried fruits and much of Victoria’s cask wine production. There are also Mildara Blass Wines. Red Cliffs, south of Mildura, also has citrus orchards and vegetable growing. Irrigation has caused salinity of the soil and in the river waters. Drains worked well enough until silt stopped their effectiveness. In 1968 a drainage interceptor at Lake Hawthorn, west of Mildura, enabled salt to be captured by evaporation. Another interceptor program has been installed east of Mildura. A better solution is considered to be drip irrigation in place of flood irrigation. 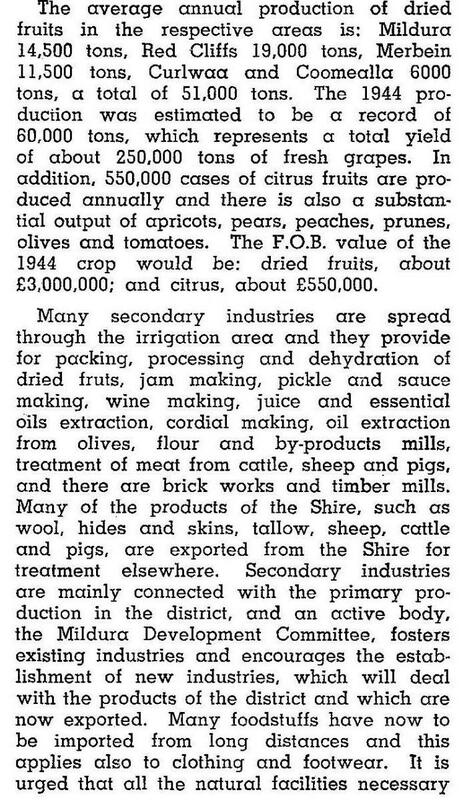 In 1994 farming occupied 53% of the shire’s area of 10,145 sq km. The grape harvest was 267,550 tonnes, 75% of the Victorian harvest. The mainly dryland areas carried 148,000 sheep and lambs, 9000 cattle and harvested 40,300 tonnes of barley and 139,800 tonnes of wheat. 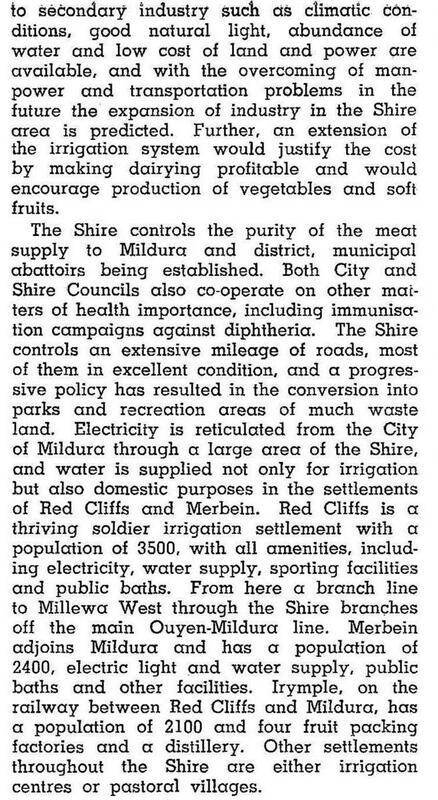 On 20 January 1995, Mildura shire was united with Mildura city and Walpeup shire to form Mildura Rural City.